Moderate to strong gusts of winds affecting mid and upper elevation terrain. Pockets of wind-drifted snow in exposed locations in mid and upper elevations. Evidence of cross-loading on all aspects. We saw evidence of recent natural avalanches today including naturals well down off of ridge lines from cross-loading including off of Twin Peaks in Mill B South, as well as Dark Ebony (slides too far away to get a decent photograph). Also evidence of crowns and debris from a number of slides that ran during the storm. We also heard of a party that triggered a slide on the Moonlight headwall, a very steep slope just below the west ridgeline of Mineral Fork. These slides were likely from fresh wind drifts from the southerly winds that drifted and cross-loaded mid and upper elevation aspects. Southerly winds created pockets of wind drifts at the mid and upper elevations. Photo below shows winds working well down off of ridgelines in Mineral, down to 82'00'. Cornices continue to grow larger along leeward ridges. They are beginning to get quite large, and could break back *much* further than expected. Am expecting wind drifts to continue to develop as winds increase ahead of the weak system Saturday afternoon. These winds are adding stress to a snowpack that has already had a significant load of water and wind-loading from earlier this week. We dug two pits today: 8100' and 8500'. These were on northerly aspects where Trent had seen preserved facets (observation) that were on the old snow surface prior to the onset of the storm on Saturday night. At 8100' the facets are capped by a 3-5mm rain crust, and we got ECTP21 failing in the weak facets just below the crust. This layer is quite obvious, and is 50-60 cms below the surface. The second pit was 400' higher (8500'), where the crust wasn't present, but the layer of facets was still identifiable. ECTP21, but failing in a storm snow density change down 50 cms, and not in the faceted layer below. A third pit at 8400' was ECTN25, failing in the faceted layer down 60 cms. Overall the feeling we came away with was that the rain crust is at a specific elevation band (approximately 7800'-8400') and very spatially variable. Above 8400' where the crust isn't present the layer of facets that were at the old snow surface seem to be gaining strength. Biggest concern for the weekend will be wind-drifting. 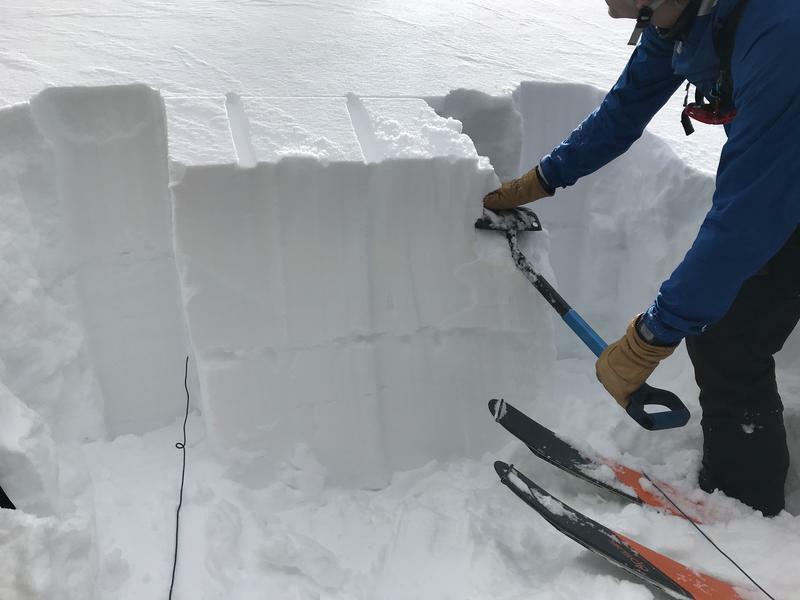 In addition to fresh drifts running on the snow surface, there are faceted layers in the snowpack, and density changes within the storm snow, that may also be reactive to additional loading. Hazard is solid Considerable in wind-loaded terrain. Moderate in terrain that isn't wind-loaded. However, we chose to avoid steeper lines in non-wind loaded terrain today as the weaknesses within the storm snow remain a concern on steep (> 35 degrees) slopes.